C# switch statement is a selection statement. 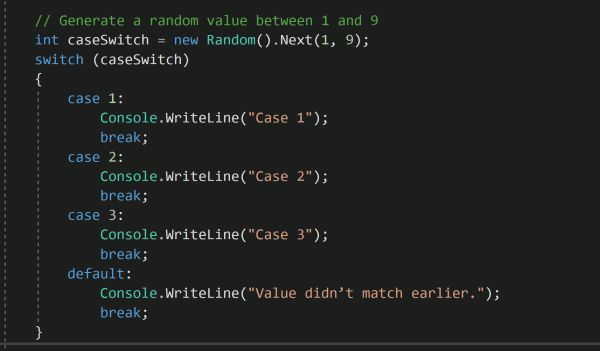 Learn how to use a switch in C#. The switch case statement in C# is a selection statement. It executes code of one of the conditions based on a pattern match with the specified match expression. The switch statement is an alternate to using the if..else statement when there are more than a few options. The code examples in this article demonstrate various usages of switch..case statement in C# and .NET Core. The switch statement pairs with one or more case blocks and a default block. The case block of code is executed for the matching value of switch expression value. If the switch value doesn’t match the case value, the default option code is executed. The following is the definition of the switch..case statement. The expression in the above code can be any non-null expression. Listing 1 demonstrates a typical switch statement. The switch expression is a random number between 1 and 9. Based on the value of the expression, a case block is executed. If the value of a switch expression is doesn’t match with first three case values, the default block is executed. The case statement can be a statement of one or multiple statements or nested statements. Listing 2 uses multiple statements in case 1. Let’s find if today is a week end or a week day. Listing 3 uses an enum in a case statement and checks if the DayOfWeek is Saturday or Sunday, it’s a weekend, else it’s a work day. You can execute the same code for multiple switch expression values. In Listing 4 example, if the value is Color.Blue, Color.Black, Color.Orange, or default, the last line of code is executed. The case statement defines a pattern to match the match expression. There are two types of patterns, constant pattern, and non-constant (type) pattern. The constant pattern tests whether the match expression equals a specified constant. In case of a constant pattern, the case statement is followed by a constant value. A bool literal, either true or false. Any integral constant, such as an int, a long, or a byte. If match expression and constant are integral types, the equality operator ‘==’ is used to compare the value and returns true for the matching value. Otherwise, the value of the expression is determined by a call to the static Object.Equals method. Listing 5 is an example of using a char constant in a switch statement. Listing 6 is an example of using a string constant in a switch statement. The switch statement can use a type as an expression. where type is the name of the type to which the result of expr is to be converted, and varname is the object to which the result of expr is converted if the match succeeds. expr has a compile-time type that is a base class of type, and expr has a runtime type that is type or is derived from type. The compile-time type of a variable is the variable's type as defined in its type declaration. The runtime type of a variable is the type of the instance that is assigned to that variable. The following code example in Listing 7 uses a type to compare with an enum, an Array, and a List as an expression in the switch..case statement. This article and code examples demonstrates various use cases of C# switch..case statement.